A pottery covered jar (zun) of cylindrical form, supported on three moulded feet in the form of bears that rest their hands on their knees. The straight sides are evenly divided into two parts by ridges. Each part is moulded in relief with a mock-handle in the form of a taotie mask with a ring, and applied with a procession of animal and hilly landscape reliefs. The conical cover is modelled as overlapping mountain peaks, interspersed with small cavities that hold animals. The exterior of the zun is covered in a glossy green glaze that has acquired a metallic sheen overall. The interior is covered in a brownish-green glaze. The interior of the cover is unglazed and reveals the rough, red pottery body. A new interest in landscape emerged and became a recurrent feature of Chinese art during the Han dynasty (206 BC – 220 AD). The swirling, painterly style of the landscape and animal figures portrayed on this burner represents the Daoist ideology of this period. 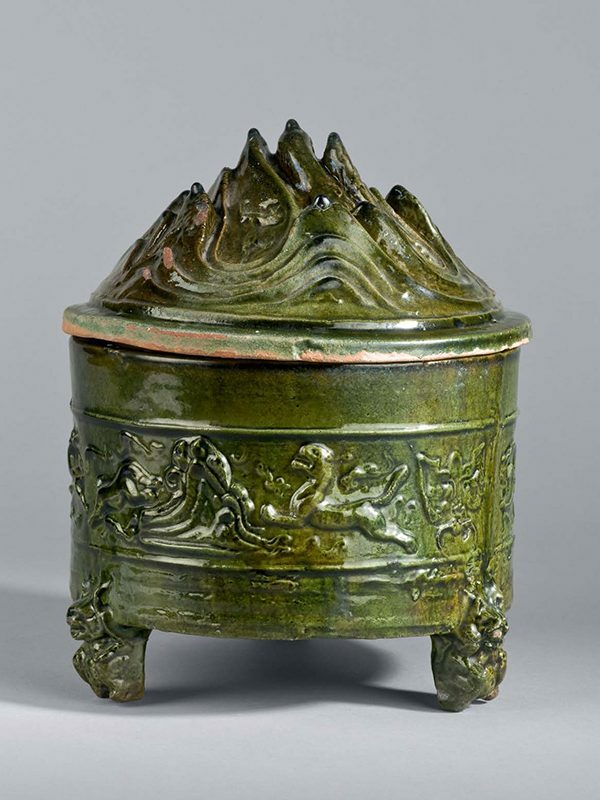 The mountain-shaped lid refers to the sacred dwellings of the immortals, the Kunlun mountains, which were ruled by the Queen Mother of the West. The tiger, boar, winged creatures and hills shown here are comparable in style to those that decorate lacquer wares and are also seen in woven brocades of the period. Many poems written at this time celebrate the royal hunts that took place in the imperial game parks as a formal display of imperial power. Han dynasty pottery shapes often have parallels in metal, which is the case with this zun. Krahl observes that during the Han dynasty tombs were often looted, which resulted in expensive materials such as bronze gradually being substituted by cheaper materials such as pottery, and that the poisonous lead content in the glaze would have made pieces such as this unsuitable for storage of food and drink. Because of the poisonous element in the glaze, the present jar, the shape of which is often referred to as ‘hill jar’, was more likely used as an incense burner. A bronze zun of closely comparable shape and design, dated to the Western Han dynasty, was excavated from Gansu province and is now in the collection of the Gansu Provincial Museum. A very similar pottery green-glazed zun, closely comparable in shape and decorative motifs, is in the collection of the British Museum. Two further comparable examples are in the Meiyintang collection.